Posted on April 14, 2018 at 3:51 pm. The foundation Swami Radha laid lives on. After three months of reflection and practice, some students from the Yoga Development Course (YDC) are heading home to test their expanded understanding, while others are launching into the Hatha Yoga Certification to become teachers in the Yasodhara tradition. In this newsletter it is inspiring to hear how the YDC translates into graduate studies at Columbia, how a family has experienced meaning in their two months of Ashram living, and how a baker tested her incredible Italian bread recipe on residents as part of an Artist & Professional Renewal Retreat. 2018 is our Year of Invitation. There are may ways to enter – through courses, through Karma Yoga, through retreats. We are especially happy to introduce you to the Temple of Light – a sanctuary for now and next generations. Thank you to all who keep the vision alive through willingness to do the work of building character, courage and awareness. And thank you for your most generous support, which helps keep the Ashram going! 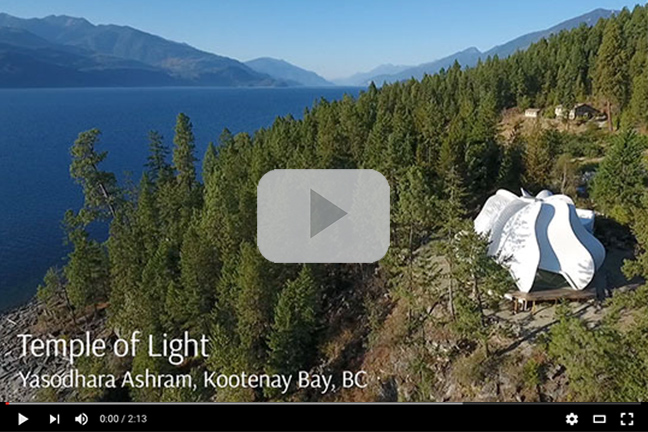 Consider this video your personal invitation to join us at the Ashram this year. 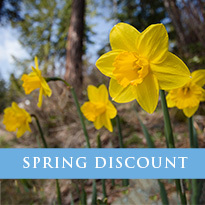 This spring we offer a 15% discount on 2 and 4-day courses and retreats from April to June. Review the options available including a 2-day Breath: The Invisible Work retreat to the 4-day Transitions: Embracing Change course. Sign up now or gift a friend! Join Pahan Pte San Win and Wanbdi Wakita on their return visit to the Ashram. Explore the concept of reconciliation and create personal action plans to begin the practice of reconciliation as a way of life. Find out more. Expand your understanding of who you are and who you want to be – ten days’ reprieve from stress in a safe and nurturing place of reflection. As a participant in the 10 Days of Yoga, you can stay on at no cost for up to the next seven days to practice Karma Yoga. July 16 – 20In this retreat led by Swami Lalitananda, senior teacher and president of Yasodhara Ashram, you are invited to expand your awareness, let go of old burdens and lighten up! Discover the benefits of proven yogic practices and the limitless quality of sacred space. Open to all – whether new or experienced in Yasodhara teachings. “Selflessness is an enormous power that radiates from a person like a light, attracting others.” Swami Radha reminds us that this is the heart of Karma Yoga. The requirements are a willingness to engage in what needs to be done, an openess to learning and a heartfelt desire to serve. Check the link to these areas to read more about how and when you can be involved. (2) We are also pleased to offer our Young Adult Program and One Month Program free-of-charge from May to October of this year. These programs provide an opportunity to gain experience and offer your skills while engaging in yoga and work in a truly transformative way! Click on the links to find out more and apply today. For both of these special offers, in addition to the joy of actively being part of a dynamic, intergenerational community, you are welcome to participate in daily Hatha Yoga, weekly reflection classes and evening satsang in the new Temple of Light. We will provide you with three delicious meals a day and shared accommodation. A contribution towards your stay is always welcome but not required. Christopher J. Starr leapt from the 2017 Yoga Development Course (YDC) to enrolment in the Negotiation and Conflict Resolution Master’s program at New York City’s Columbia University – and he is amazed at how well he was prepared by his learning journey at the Ashram. He wrote to update us. Classes are going exceptionally well; the course content is fascinating. Interestingly, almost half of the assignments have been Reflection Journals where we are asked to reflect on our own theories of conflict, change and other topics. Having written reflections daily for three months in the YDC, I feel especially prepared for these assignments! I am curious if this self-reflection is part of a global trend in education shifting from teaching people to memorize information and instead to become themselves fully. I’ve used my Ashram training in other ways too! 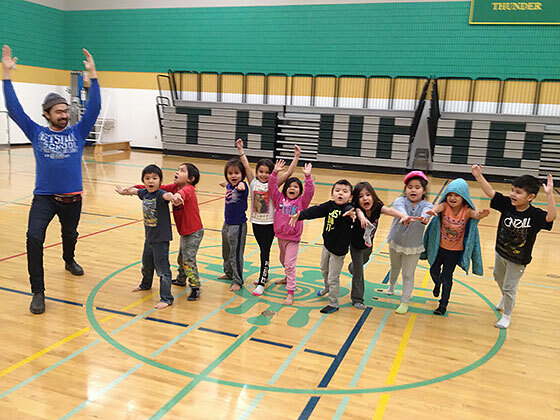 My family is from Thunderchild First Nation, in Saskatchewan. Although I never went to school there, I feel a deep connection to the community and a vested interest in the health and success of its youth. While home for the holidays in December, I offered yoga classes to the community school. The kindergarteners really enjoyed the Warrior. I am feeling blessed even amidst the perplexity of university and NYC. 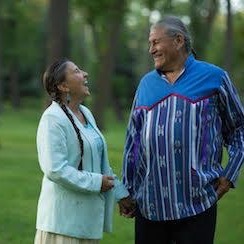 I am profoundly grateful for the foundation I have been able to build, and send many thanks to everyone at the Ashram. The direction I will take after this master’s program is still unclear to me. I feel compelled to work with marginalized communities on environmental disputes and/or focus on education reform. 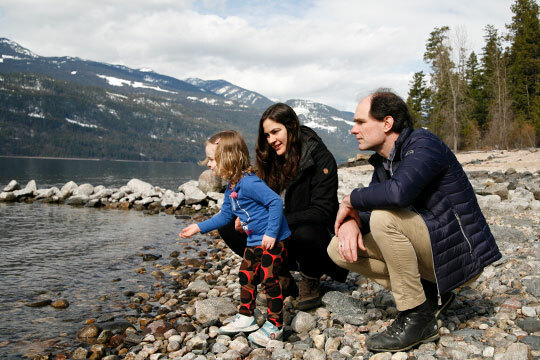 Reynold and Saskia Reynolds and their daughter Escher joined in Ashram life for two months this winter for a time of reconnection on many levels. Reynold reflects on his experience. We have been married for seven years but now think of ourselves as a new family since Escher is just over two years old. Having a child has made us want to be better parents and improve ourselves. Five years before this visit, the two of us came to the Ashram to visit Swami Premananda, my step-father, for a month. We helped build an area for the Ashram’s upcoming Family Retreat and perhaps that was the beginning of our own family. After Escher was born we had many questions: How should we raise her? How can we make improvements in our relationship and within ourselves? Who can help us on our way? Coming for these two months has been an important time for us as a family. It has been a blessing to live within a community of people working hard to be good and has helped us build up the relationship between the three of us. For over fifty years people at the Ashram have been creating a real basis for a good and meaningful life. Living here, receiving wisdom and Light, is sure to give Escher and us a stronger foundation and experiences to learn from. It has also been a way to question our choices – many that were unconscious – and look for better. It has been wonderful to see Escher grow and change. We imagine these experiences will be part of her core for the rest of her life, just as she is now part of other people’s lives. We hope that all three of us can be part of the way the Ashram is improving the world. Dana Reinhardt, a professional chef and restaurant consultant, recently spent 10 days at the Ashram on an artist/professional retreat. Her focus was unusual – she wanted to perfect a recipe she had just created for Italian-style bread. Dana, who has taken many courses at the Ashram, asked if she could come and use the kitchen. Although it had not been done before, our chef agreed. “It’s been amazing doing my work at the Ashram. I see the deer every morning from my snug cabin and fall asleep to the sound of the creek. It was the perfect fit for me,” says Dana. It was also delicious for all the taste-testers as she served her bread with lunch! Artist and Professional Retreats are for people from all disciplines including writers, musicians, executives, health-care workers, visual artists, freelancers, people on sabbaticals – and anyone wanting to tap into their creative potential or de-stress and recharge. A variety of accommodation options are available. Retreats provide the opportunity to step back from day-to-day routine and focus on a specific project. Artist and professional participants receive the benefits of Ashram life including morning yoga classes, healthy meals, evening satsangs, access to prayer rooms, the Temple of Light, and the forests and beach of the Ashram grounds. Guests fully participate in life in a spiritual community with an option of either two or four hours of Karma Yoga. The rest of the day is available for renewal and personal focus. Contact us for more information about how you can enjoy a retreat at the Ashram. 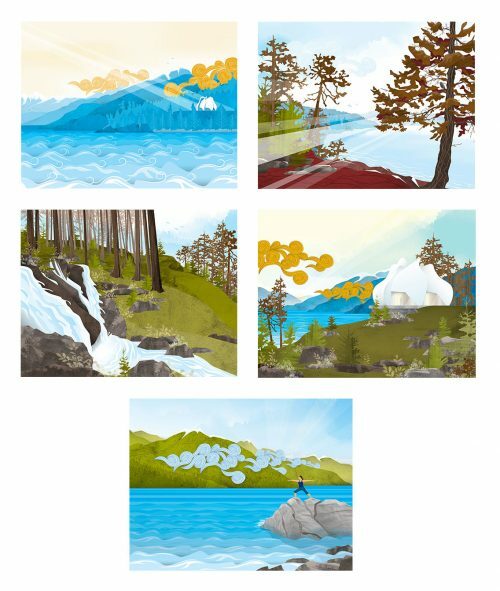 A pack of five unique, beautifully designed Ashram cards featuring illustrations by Michael Wou. Blank inside. Temple Continues to Blossom – The first Rose Ceremony to be held in our new Temple blessed the final day of the 2018 Yoga Development Course. It was a touching day for everyone, with offerings to the Divine, certificates handed out, and grudges burned in the outdoor firepit. See Facebook photos. Large plants saved from the 2014 fire are now back in the Temple. And the Temple Prayer Room has been fully restored and is being happily used. 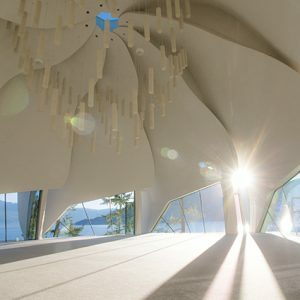 We are ready for the Grand Opening of the Temple of Light on June 23, which will be a wonderful Kootenay Lake-area community celebration combined with our annual Strawberry Social. Temple Construction Timelapse – View this 2-minute timelapse for an amazing review of the construction of the new Temple of Light, now complete. Next step is landscaping! 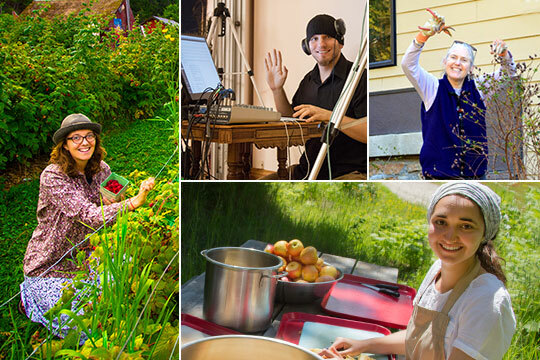 Computer and Community Grants – We are happy to announce that the Ashram was approved for $6,000 from Columbia Basin Trust through their Non-Profit Tech Grants initiative. Monies will be allocated to upgrading aging laptops, computers and hard drives. We thank Columbia Basin Trust for their support. We also gratefully received a $750 sponsorship from the Nelson and District Credit Union to support the Walking Together into a Hopeful Future workshops on reconciliation in April. Gain Experience as a Learning Resident – Three-month residencies are available in many areas of the Ashram and offer an opportunity to learn and contribute within this flourishing spiritual community. Check out the options in Hospitality, Garden, Kitchen, Preserving Kitchen, Lands & Groundskeeping, Infrastructure and Communications. 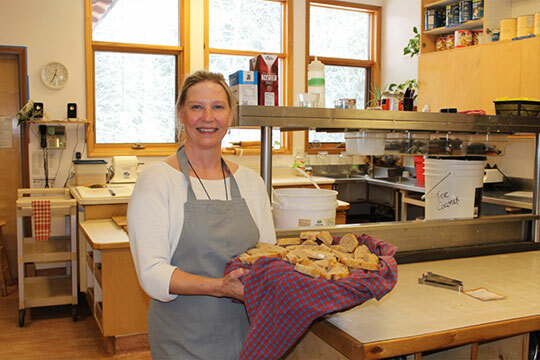 Eating Sustainably – Learning Resident Anne Calder offers her second installment in a series of articles from the Ashram kitchen. This article focuses on the Ashram’s focus on seasonal and sustainable food practices. 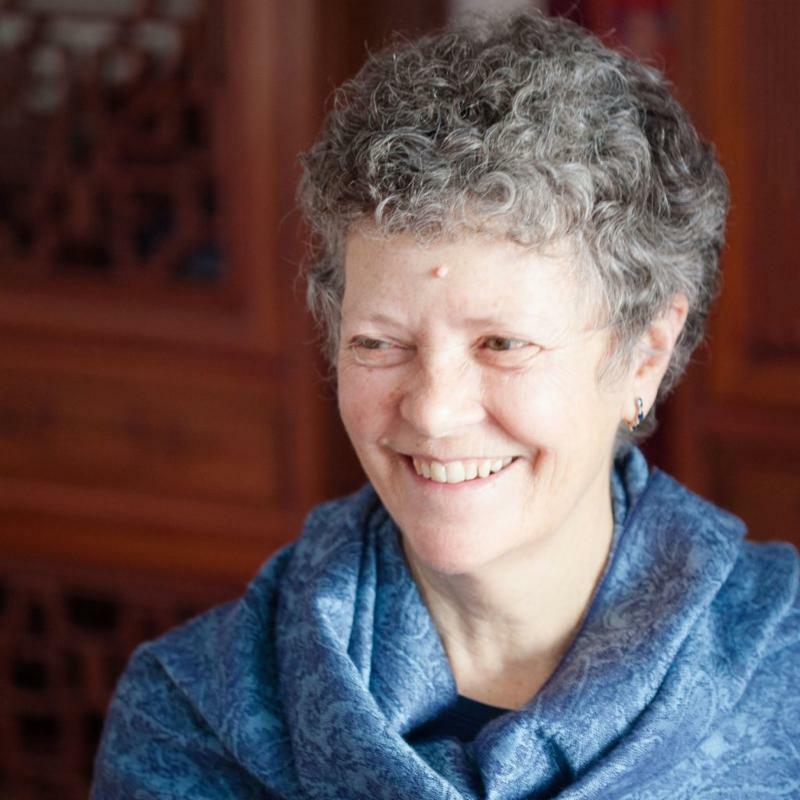 Celebration and Gratitude – On March 20, Swami Radha’s birthday, everyone at the Ashram celebrated and Guenevere Neufeld wrote a beautiful piece called Meeting Myself on her bluemountainchild blog. Take a moment to view photos and read her words. 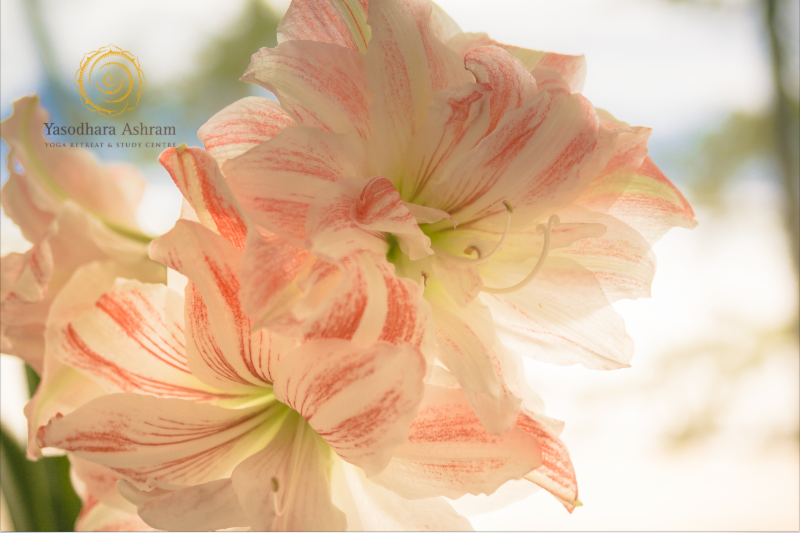 Photo credits: Thanks to Tegra of Tegra Stone Nuess Photography of Seattle for photos taken while on her first Karma Yoga stay. 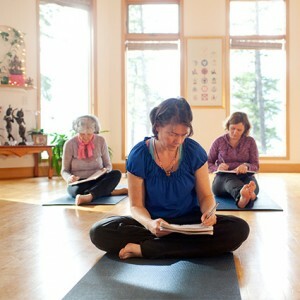 One of her classroom photos, of recent Yoga Development Course graduate Lisa Sars, leads off this newsletter. Margo Klimowicz of Calgary also recently offered her photography skills; we thank her for the Reynolds family photo and the Desktop Photo in this issue.